And as with every year, you’re all invited to write your own mini-retrospectives in the comments. Just follow the rubric we’ve laid out here—set up your rationale in the first sentence and go from there. (It’s fine if your picks overlap with ours, because you’ll probably have a different reason for digging a game.) We’ll collect some of our favorite responses in a special Games You Liked edition of Keyboard Geniuses on December 30. In part one, we’ll hear from Anthony John Agnello, Sam Barsanti, Alexander Chatziioannou, Matt Gerardi, Zack Handlen, and William Hughes. Make sure to come back tomorrow for part two! I liked Oxenfree because it let me cut people off mid-sentence. Its dialogues felt natural, like an actual recreation of conversation in situations that ranged from deeply normal to Punky Brewster Halloween-special levels of insanity. Existing at the center of a Venn diagram where a particularly scary episode of Are You Afraid Of The Dark? intersects with Maniac Mansion and My So-Called Life, Oxenfree’s ghost story on a haunted island drags you through creepy but rigid story beats. There are all the broken friendships, potential romances, and dimensional rifts promised right up front. While they unfold in a surprising way, it doesn’t feel like you have much control over them until you get deeper into its conversation system. When someone speaks to protagonist Alex, whether it’s her new stepbrother or her old friend Nona, she’s given multiple options to respond, but how the story unfolds depends not just on how she says something but when in the flow of conversation she says it. The result is a familiar supernatural teen drama that resonates powerfully with anyone who remembers what it was like to fight with friends at that age. Plenty of games have made conversation their crucial hook, but they lack the naturalism Oxenfree makes look effortless. I liked Titanfall 2 because BT is the swellest of robots. Titanfall 2 didn’t need a robot best friend at the heart of its story, but it definitely needed the story. The original game landed as explosively as its titular mechs back in 2014, but it quickly tripped over itself with a gruel-thin presentation. The team-based combat was strong and the aesthetic of its science-fiction world was functional, but it just felt empty without a campaign to bolster it. It didn’t need much: some killer level designs that let you use the agility of its human characters as well as its stomping mechanical suits, a selection of boss fights to make it feel special, some big set pieces, and you’re done. But Respawn made a hell of a lot more than that. BT, the mech your blank avatar is unexpectedly paired with at the top of the game, is an odd amalgam. He’s part robot dad, best friend, pet, brother, and sensei. One moment he’ll be teaching you basic tutorial facts, and the next he’ll be cracking dry, monotone jokes about being in love with new weapons. The sheer presence of BT elevates everything else in the story. Every big scene would just feel like a novel premise without a soul if he weren’t there to guide you along. By the end, BT’s helping hand makes the whole thing feel like the sort of action movie Hollywood stopped making in the early ’00s. Yes, plenty of robots explode in the name of freedom or something, but characters also talk to each other. They’re people who want things. The one talking the most just happens to be a robot you can ride and use to hit other robots with a sword. I liked Call Of Duty: Infinite Warfare because the series finally stopped trying to make its villains anything but unrepentant monsters. The original Call Of Duty games were set in World War II and were all about killing Nazis, so you never had to feel too much sympathy for the nameless soldiers you were butchering. As the series went on, it tried to be more “mature” by introducing storylines that weren’t so cut-and-dry and villains that had a little more depth, but it never clicked. As much as some of the developers may wish it were the case, Call Of Duty has never—and will never—be about telling compelling wartime stories. It’s about putting players on a roller coaster through crazy explosions, and it’s been years since the series nailed that as well as it did with Infinite Warfare. A lot of that is because of its villain, a space-fascist played by Game Of Thrones’ Kit Harington, and though his performance isn’t going to blow anyone away, his frequent supervillain speeches are the only character development he needed. Harington’s character was an embodiment of Infinite Warfare’s relatively elegant and simplified approach to the series, and it’s almost a shame that he gets killed in the end—not really, though, because he was a huge jerk. I liked The Division because I got married in New York last winter and that made its setting uniquely unnerving. Let’s back up: The Division takes place in a world where a virus was unleashed in New York during the holiday shopping season, killing nearly everyone in Manhattan (pretty cheery stuff). You play as a special operative sent in to take back control of the streets from gangs, unhinged sanitation workers, and rogue military personnel, and it’s all set in a fairly faithful recreation of Midtown—or at least a big chunk of it. Madison Square Garden is basically where it’s supposed to be, as are the High Line, Macy’s, and Times Square. They’re just overrun with the aforementioned gangs and unhinged sanitation workers. The game’s map also contains the approximate location of the hotel my wife and I stayed at after the ceremony, so I was able to go there in the game and walk the same streets the two of us had seen just a few months prior, only now they were littered with discarded hazmat suits and abandoned cars. The Division is sort of a shooter-RPG hybrid, which can make playing it feel a little disjointed from reality, but my emotional connection to its setting actually helped sell me on it way more than the moment-to-moment action did. I imagine it’s similarly weird for people who actually live in the city, but I’ve never experienced something like that in a game before. 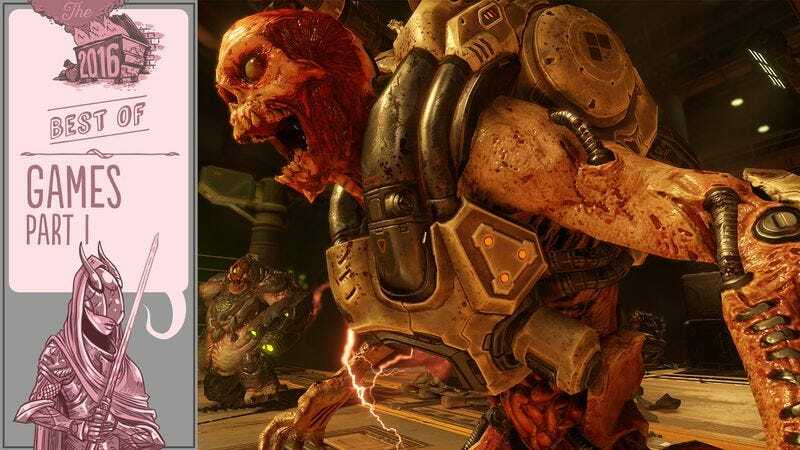 I liked Doom because it made jumping into the fray irresistible. The brilliance of Id’s reboot rests not on the fact that it’s defined by speed, but on the ways it redefines what speed means for a first-person shooter. No, Doomguy is not anywhere near as quick as he was in the ’90s, but speed can also refer to things other than your character’s movement: the frenzied pace of the fireball-hurling imps giving chase as you try to hang on to your last shreds of health; doing away with silly cover mechanics that have only served to slow down lesser shooters; never having to reload. Most importantly—in the design choice that arguably elevated Doom’s campaign into the most satisfying single-player shooter experience of 2016—speed can be defined as the shrewdly engineered necessity to constantly shift your tactics between fight and flight, between long-range combat and closing in for the Glory Kill in order to replenish your ever-dwindling resources. Its story may lack the emotional impact of Titanfall 2, but when boot-stomping a demon skull into a bloody pulp is so much fun and rewards you with a sweet shower of green and blue pickups, who the hell cares? I liked Dark Souls III because I could see Hidetaka Miyazaki’s fingerprints all over it. Despite what overenthusiastic achievement hunters will try to assert, the original’s core feature was never its misunderstood difficulty. Subtler elements like the complexity of near-Escherian levels folding inside themselves and the opacity coating every aspect of the game, from Lordran’s layered history to the workings of its peculiar online cliques, made it the unique experience that it was. Dark Souls II was not a bad game in any sense of the word, but it did feel, well, hollow, eschewing most of the mystery, simplifying the geography, and streamlining travel between bonfires. For a while, I was doubtful Dark Souls III would amend this, starting with a tutorial level that is linear, predictable, and aesthetically generic. As I progressed, however, some of the original’s magic started coming back: hunting for small pockets of inscrutable lore tucked away behind moss-covered tombstones or inside dimly lit alcoves; struggling to mentally reconstruct the tangled layout of the Cathedral Of The Deep; taking in the eerie majesty of Irithyll. Miyazaki, the game’s auteur director, allegedly once scolded a young artist for his sensationalist approach to designing an undead dragon, crawling maggots and all, suggesting he should “instead try to convey the deep sorrow of a magnificent beast doomed to a slow and possibly endless descent into ruin.” It should be no surprise, then, that it took this man’s involvement to restore the series’ poignant beauty. I liked Owlboy because its pixelated cast is more expressive than any in three dimensions. Final Fantasy XV and The Last Guardian weren’t the only 2016 releases that spent close to a decade in development. This platformer was first announced in 2007, and the tiny, shifting team that carried it to completion never backed down from the project’s initial goal: to show the world pixel art could be beautiful too. That “retro” aesthetic has seen a humongous resurgence since Owlboy’s inception. Other games rose to take up D-Pad Studio’s cause and turned out striking pixel-based visuals, but none of the efforts we’ve seen in the last nine years can match the subtle detail, elegance, and, especially, emotion of Owlboy. While the game’s dreamy world of floating islands and ancient technology is superbly drawn, what’s more impressive is the care D-Pad Studios put into its cast of characters. In the grand tradition of our most beloved cartoon characters, they’ve been gifted with big, expressive faces that allow them to exude simple yet effective emotions and traits. Even bit players get distinct, emotive scenes that work wonders for endearing them, like Boguin, the simple-minded penguin-like critter who’s kept locked inside by a two-faced shopkeeper. And Otus, the game’s star, makes up for his muteness—which is derived from an actual disability, rather than some unexplained vow of silence—with a suite of expressions and body language that ranges from delightful to downright heartbreaking. I liked Firewatch because it understands escape has both benefits and dangers. We escape into stories and fictional worlds all the time, and to a certain degree, it’s a perfectly reasonable and healthy way to remove ourselves from life’s stresses. But there comes a point where distance and distraction needs to fade away, where you face whatever difficult reality is coming down upon you, lest it grow into something even more destructive while you’re not looking. For Henry, the star of Campo Santo’s gripping debut, his new job as a lookout in a national park is an opportunity to escape from a life that has been slowly, tragically, and ruthlessly falling apart. He leaves those very real, very calamitous troubles behind and throws himself into near-total isolation. His one tie to humanity—other than the snotty teens he finds littering in the park—is Delilah, his supervisor who he never meets face to face but spends the entire game communicating with by radio. She’s troubled as well, haunted by the mysterious disappearance of a colleague and his son, and together they fall into what appears to be a conspiracy within the park, itself both a reflection of the kind of exciting genre story we as players want to be swept up in and yet another means by which the two lookouts can find escape and purpose. The game’s ending was divisive at the time, as the park’s mystery is revealed to be fueled by an extreme example of escapism gone wrong, and the relationship between Henry and Delilah comes to an abrupt conclusion. But the message in both those turns is clear and vital: A little time off is a great, oft-necessary thing, but realize reality isn’t going away and leaving it behind might end up costing you a whole lot more. I liked Inside because it didn’t have a single audio log. There’s a backstory to Playdead’s ingenious adventure game Inside, but it’s one told entirely in the moment. The story starts without a word: A small boy is fleeing through a night-shrouded forest from adults who seem to wish him harm. There’s no dialogue, no expository text, and at no point does the protagonist stumble over a recording that explains just what in the hell is going on. Everything we learn about the boy and his world is told visually—through locations, through threats, and, in a particularly nice touch, through how you play the game. The effect is simultaneously ambiguous and specific, a journey with a clear narrative to tell, but one that leaves the nuance and interpretation up to individual players. While this approach might not work for longer games, it’s gratifying to play something that never feels the need to belabor the point or force-feed exposition in order to get that point across. You start running and see what happens next, and one of the joys of gaming in 2016 was seeing just how creepy and unexpected “next” could be. I liked Batman: Arkham VR because it taught me to mind my surroundings. Let’s get the obvious out of the way first: There are limitations to virtual reality. In Rocksteady’s Batman: Arkham VR, you don’t walk anywhere, you don’t drive, and you don’t even get to punch anyone. The game takes maybe 30 minutes for a single play-through, and few of its mechanics or puzzles are more than skin deep. They don’t need to be deeper, though. While VR may still be stuck in the gimmick phase of its development, it’s one hell of a gimmick, and Batman finds plenty of simple ways to let people feel like they’re standing in Bruce Wayne’s shoes. From the opening menu, which shows a Gotham City stretching off in every direction, there’s a sense of presence and place that makes the shortcomings easy to overlook. The plot, a hodge-podge of bits leftover from previous Arkham games, is really just a teaser for the longer version to come. Anyone looking for a complete experience will be disappointed, but for anyone who’s wanted, however briefly, to throw a Batarang, mock the Penguin, and analyze a crime scene, look no further. I liked Overwatch because it managed to make every member of a huge cast feel distinct. How many games can boast a character roster 23 fighters deep and truthfully claim that each one feels like their own man, woman, or cybernetic gorilla? Blizzard’s hit online shooter pulls the task off by remembering an all-important rule: Less is more. Glossing past their elaborate backstories, every Overwatch character can be boiled down to a weapon, a basic role, and a couple of skills, a simple kit that allows players to intuitively grasp, say, Mei’s job throwing down ice walls to break up the enemy team, or Genji’s role as harasser extraordinaire. By settling into each character’s sweet spot and playing within it—lobbing bombs as the maniacal Junkrat or implacably tearing enemies apart as the placid Bastion—the game ensures that even novice players will frequently score big “hero moments” and Plays Of The Game. Meanwhile, Blizzard’s top-notch character designers have given every warrior a distinctive, easy-to-read silhouette and feisty voice clips, infusing all the members of the Overwatch team with larger-than-life personalities and crucial recognizability in a fight. Overwatch’s characters are clichés, but they’re the good kind of clichés: bright, bold cartoon characters that tell you everything you need to know about them in a single, colorful glance. I liked Hyper Light Drifter because it made me feel like a badass laser samurai. Heart Machine’s Day-Glo-colored action gem has a secret engine driving its palm-clenching success: fragility. Arrayed against massive armies of pixel-crafted monsters, your titular Drifter is equipped with little more than a fast sword, a damage-dodging dash, and a few scant dots of health. Hyper Light Drifter is the kind of game where getting hit more than once in a fight is a fail condition, and the goal is to slip past damage with balletic grace. It takes a while to get there, but by the time you’re dancing around monstrous frogs and slicing apart murderous bird priests in the game’s gorgeous, gory post-apocalyptic world, you’ll feel like a properly paranoid master combatant, tuned to every twitch of its murderous design. It’s not that Drifter is punishingly hard. It gives the players the tools to look, feel, and be amazing, and then trusts them to find their way to success.